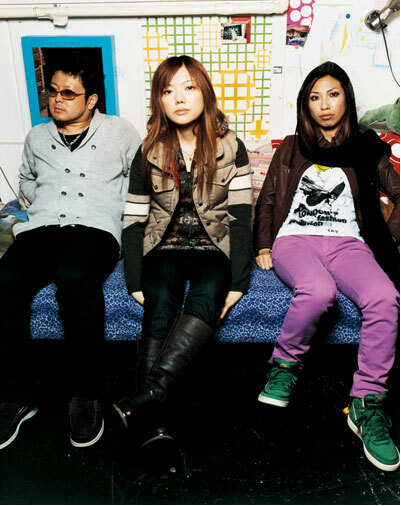 This June, GO!GO!7188 will celebrate the 10th anniversary since their major debut. Akko (bass/vocals), Yuu (guitar/vocals), and Turkey (drums/vocals), whose music is nostalgic even on the first listen, have continued to play cute and exciting rock. They’re for sure a rock band that couldn’t have come from anywhere but Japan. A year and four months after their last album, “Antenna,” GO!GO!7188 changed labels while in the midst of a rigorous tour and a battle of the bands series. They’ve now completed a new album, “Go!!GO!GO!Go! !” Having arranged more colorful and poppy songs than ever before, they’re evolving a flavor that only they could produce with their scaled-up performances. In this interview, they’ll candidly discuss what they were aiming for with this album. --This is the newest album since your last, a year and four months ago. How long have you been working on it? Yuu: Since the beginning of this year. We took the first part of January off, but since then we’ve been writing songs, started rehearsing in January, held our live performances in February, and have been recording since March. --You have the songs you’ve performed in lives, but it seems like you want to play them live as soon as you can. Akko: We’ve been playing the songs wrote last year since last year, but this time we really want to play a live if we can, so we’ve been slowly going in that direction. --Did you begin talking about playing these songs in a live before they were post-processed? Yuu: Well, yeah. We got a feeling for the songs that could be played soon at a future live. --Are they the songs that are easily digestible? Akko: Playing a song in a live before recording it is unnatural, so we wanted to try as best we could. --The songs on the new album are rich in variety and are very fun, but did you write them thinking that you’d like to write songs with a different feeling after these were done? Akko: Looking at the balance of the whole thing, we’ve done the songs we have because we have songs like that. But this time, from the very beginning, there’s clearly a Japanese taste, there’s surf rock, and things like that. The theme from the beginning was just making this kind of music, right? --With that album theme, was there anything in particular you were thinking of? Akko: The entire album doesn’t have a theme, but we used the things we have. (Laugh) While doing that we’re doing up until now, we thought “This is very GO!GO!7188-esque,” and there were the parts of what we’re thinking. And we did that, thinking “Is this the right feeling? Is that the right feeling?” It wasn’t something that just flowed out of us, and that’s what we were going for. --Do you want to broaden the image you’ve had up to now? --So then, it’s not so much that you’ve been able to create Japanese-style songs, but rather you set out with the clear intention of going in the direction of creating songs with a specific Japanese style? --On your last album, “Antenna,” there was a feeling like “This is GO!GO!” throughout, wasn’t there? Akko: At that time, on the contrary, there was a feeling of creating and having fun with that kind of item. --What other keywords can you use to describe the feeling of the various songs? Yuu: Also, we’re always making ballads. The ballad we did this time, called “Ballad,” was written over ten years ago. Also, there are songs that we’ve always wanted to do in a live. And songs that act on a two-person chorus. That kind of thing. --I think I know which keywords go with which songs. (Laugh) There’s an interesting chorus from the first song, “Eoeoe,” but is this a hint? Yuu: In this album there are a lot of songs like that one. Like a negotiation. Somehow or other it occurred to us that “it’s fine to do it this way” many times. --The two singing voices becomes an integral part of the song, just like musical instruments. Yuu: Yeah. There are ranges that my voice can’t hit, and even though I want to do something in particular I can’t. In those places, we express it with Akko’s voice. There’s a feeling that we made use of that. --And it’s not just in the chorus, it’s in the rest of the performance as well. There’s a clarity to your objective and the concept of the sound, even how to use a guitar riff. Akko: The various roles can be clearly felt. We feel like we had fun with that. --The lyrics, along with the sound, seem to imbue the music with a theme. Akko: We were conscious of something like that, but this time writing the lyrics was just fun. It’s always been that way for us. We ride on the fun. That’s the feeling we have as we write them. --It seems that, because of that, there are a lot of positive things about the music. Were you aware of this as you wrote? Akko: It was really run to write. (Laugh) We’re bad at writing a song then attaching lyrics, but this time even that was fun. Akko: There is, isn’t there? Yuu: Yeah, from before our debut. --Did you play it in a live? --So did the first form the base of the second? Yuu: And now “2” is established. (Laugh) And then with the song “Ballad” we never had the timing to release it, so this time we made sure to add it to the album. --Is there a reason you decided to put it onto this album? Akko: But because we prefer to put out newer songs we always did that on previous albums. But this time, we thought if we already have a good ballad, can’t we just use the energy from it? --Indeed. With the ballad named “Ballad,” are you going for the same feeling as naming a punk song “Punk” or a rock song “Rock” (as you did in your album “Dasoku Hokou” from 2000)? Did you write it around the same time? Akko: Yeah. From back just before we came to Tokyo, I think. --A song from 10 years ago. Do you remember anything from that time? Yuu: Was it 2000? When we played at Shibukou [Shibuya Public Hall]. Akko: We played twice at Yaon [Hibiya Open-Air Concert Hall], too. --Is this a song that fans might know? Yuu: The people who know it would know it. Akko: It’s on the “6.21 Jiken” DVD. --And you only just got a studio recording? --Did including 14 songs have an effect on the optimization of the compositions? Akko: (Laugh) Yeah, we did a lot of songs, didn’t we? Yuu: Yeah, but there was more to put in. We had more repertoire than normal. --And is there a reason for not including the songs you didn’t include? Akko: We don’t have anything like that. When we record things and review them, they’re pretty good. We’ve substituted some songs, because they move up the ranks. But for the ballad, we really felt that “Nothing2” and “Ballad” were necessary. The band promoting "Tora no Ana 2"
--To go back to what we were saying in the beginning, whether because you played a song during a live, it feels as though all your work flows in the direction of performing at lives. Akko: We’re always aware of this, but it always turns into a sort of far-off thing. (Laugh) We create the kinds of songs we want to do in a live, but there’s this feeling like the work we actually make isn’t what we wanted, but this time we were able to express ourselves with all of the songs. Of course, we express them in lives, thinking we want to give our best, but only now do we feel like we’ve come even a little close. --Do you have any special stories about recording? Yuu: A pretty good one. We recorded one song in the studio of Manabe from NEATBEATS. Turkey is the guy singing. Yuu: Manabe recorded, and let us use all his instruments, the vintage ones. It’s the first time we’d played in those kinds of circumstances. --Were you able to play guitars older than yourselves? Staff: This was a 1,500,000 yen (~$16,500USD) Esquire Custom made in ’63. --So then were you able to record with any of the vintage equipment? Akko: With that song, we made it thinking we’d let Turkey sing. This is also a series. (Laugh) We played it, saying “A boogie, this time!” but we don’t have any roots in that, so it’s not really that good. We were thinking that, then we unexpectedly came up with something at a NEATBEATS event. We saw their live and it hit us: “Wouldn’t it be awesome to record at Manabe’s house?” we thought. And, if Manabe lets us record, not necessarily producing, but if we record together, it seemed like the song would get a lot better. And Manabe was interested, too. --Any impressions on singing that kind of song? Turkey: The mic, a mic with really good reception (laugh), and the feeling that this was out of the ordinary. --Like it wasn’t your voice? Turkey: Yeah. When I came into the song, the pitch was all over the place, but I thought, “Ahh, but it’ll be okay in the mix.” (Laugh) Even though I wondered if that was true, it really did sound fine in the mix. “Because it’s cool to be a little outside myself,” I thought. --What are you going to do onstage? --Anyway, did you choose the mouth on album jacket to mimic the Rolling Stones’ tongue logo? Akko: The album title is “Go!!GO!GO!Go! !” and when we thought about things give us that feeling, we arrived at a screaming mouth. So we asked to go with the mouth. --There’s also a meaning to the title, isn’t there? Akko: It would be “Go!! Something Go! !” wouldn’t it? We even tried a unicorn. We were thinking that before we thought that if we did that with ourselves it would be “Go!!GO!GO!Go! !” We just had words. And while making this album, we thought that it would turn out to be a very energetic album. When we thought about the title, these words smacked us, and we thought they’d make a great title. --You added an intro to the album, but do you think this will become a staple of your live performances? Akko: Hmm. That would be interesting. It’s fun to think about. --Anyway, what are your thoughts on the acoustic lives you began playing in Kudan Kaikan in Chiyoda-ward on May 5th to celebrate the 10th anniversary since your debut? Akko: That was a great experience. I’m glad we did it. --What was great about it? Akko: First of all, I said I wanted to do acoustic, and we just thought, “Okay, how do we do this?” (Laugh) We aren’t producers, but everyone looking at the entirety of it contributed keyboards and strings and percussion and thing. Anyway, we started out playing with a large number of people, and it really reaffirmed our songs. Even till now, we’ve deconstructed the songs we’ve done at lives, and because we assembled them as acoustic work we had to look hard at the framework, and found places that we wanted to see. It was really interesting. It was good study. --Did you change everything down to the feeling of the beat? Yuu: We changed everything. We feel we really devoted ourselves to the song, and that in itself was fresh. We did songs in only string quartets, without playing any guitar. It was extremely fresh. Personally, this was my first time playing alone on an acoustic guitar. When working with the strings, the various songs were fresh. The songs we chose were difficult, and there were a lot of songs we wanted to play. Akko: The songs that we played so greedily in the first and last half of our three-person lives had a lot of places where they didn’t rouse us when we played them acoustic. Always in the middle of playing, it wasn’t the song, the melody was solid, but the tempo on slower songs changed a lot. It was a good feeling. That interpretation was also really fresh. --Is it a hint of songs to come? --Are you planning to also release an acoustic disc? Akko: Recording? I don’t know about that… (Laugh) I played the acoustic bass. It has slippery strings. It was a very intense learning experience, like playing a totally different instrument (laugh), but it was fun. Recording is tough. (Laugh) But it was fun to play a live like we’re putting out a really great album. We’re thinking of making a CD of live music.